The U.S. Congress is leaning on the U.S. military department to halt cooperation with the Russian supplier of military equipment Rosoboronexport, with which the Pentagon is bound by a large contract for Mi-17 helicopters, to be transferred from the U.S. to Afghanistan. The U.S. Congress is putting pressure on the U.S. military department to cease cooperation with the Russian supplier of military equipment Rosoboronexport, with which the Pentagon is bound by a large contract. Under the terms of the agreement, the Russian company is required to supply a large batch of multi-purpose Mi-17 helicopters, which are to be transferred from the U.S. to Afghanistan. The U.S. Department of Defense is asking Congress to be “flexible” and not consider any sanctions against the Russian exporter, as the breach of this contract threatens Washington with a fine of up to $100 million, according to the Christian Science Monitor. Sanctions against Rosoboronexport had been imposed during the presidency of George W. Bush, but they were canceled when Barack Obama came to power. Now, the U.S. Congress proposes to terminate the contract without paying any penalty. “In my view, if it’s simply penalties for breaking contracts, let the Russians try to collect from us,” said Senator Blumenthal, who chairs the Senate Armed Services Airland Subcommittee. It is proposed to supply Afghanistan with the American CH-47 Chinook instead of the Russian helicopters (Russia still has to transfer to the U.S. another 21 rotary-wing aircraft). 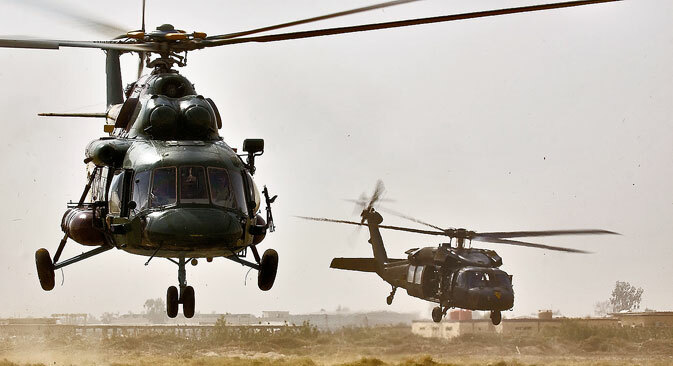 As shown by a special analysis, carried out by the U.S. Central Command in 2005, the use of the Mi-17 in Afghanistan turned out to be the most effective and efficient compared to other helicopters. The Mi-17 is still twice cheaper than its American and European analogues with comparable characteristics, despite the fact that the price of each helicopter is steadily increasing, having already exceeded $15 million. Due to its technical characteristics, the Russian rotorcraft is very reliable and is not as complicated as the American helicopters. According to the soldiers fighting in Afghanistan, the Mi-17 can be repaired even using improvised materials, such as cans of soda. Of course, modern American helicopters cannot be fixed in such a way. The fact that the Afghan pilots and technicians have become accustomed to this model during the last 30 years of its operations in this mountainous country speaks volumes of the Mi-17. The change of helicopter model is likely to lead to problems in the operations of the helicopter fleet, and to frequent accidents. “There is nothing to replace the Mi-17 in Afghanistan’s harsh climatic conditions,” said Vadim Ligai, director of the Kazan Aviation Plant. The very fact of buying Russian military equipment and the large size of the purchased batch is still perceived with hostility by many in the U.S. government. The Pentagon is accused of investing in the defense industry of a potential enemy, instead of supporting American manufacturers with orders. We can assume that this pressure on the Pentagon to cease cooperation with Rosoboronexport is due to the presence of a strong helicopter lobby in the Congress. The lobbyists have taken advantage of this opportune time to “push” the Chinooks. However, in the current situation, economic feasibility has fallen by the wayside. “There is a high probability that the Americans will break the contract. At the moment, they do not care that they will have to pay a large penalty. Now, political ambitions come first,” said independent military analyst Maj. Gen. Sergei Pechurov in comments made to RBTH. Speaking at a congressional hearing last year, Chuck Hagel praised the Russian military aircraft, calling the Mi-17 "simple and easy to maintain," and noting that the Afghans like the helicopter. According to Pechurov, the U.S. is preparing comprehensive measures to oust Russia from the arms markets of other countries as much as possible. “The Americans have a very serious approach to the issue of sanctions. They are now carefully studying the geography of our defense deliveries, and it is possible that Washington will attempt to bring pressure on those countries that traditionally buy our weapons,” he said. “So it could become a real problem to sell the refused helicopters somewhere else,” admits the expert. “For now, the effects of sanctions, if adopted by the American side, will not be too noticeable in Russia, but in a few years they will become quite painful,” said Pechurov. According to the agreement between Russia and the U.S., 63 Mi-17B-5 helicopters must be delivered for use by the Afghan army. This involves a number of contracts concluded at various times. This deal exceeds $1 billion, according to Rostec State Corporation.